BOSTON, MA, MARCH 19, 2018 – CenturyLink (including Level 3), AT&T, Verizon (including XO), Windstream and Frontier have gained a position on the 2017 U.S. Incumbent Carrier Ethernet LEADERBOARD, according to Vertical Systems Group’s latest research. The Incumbent Carrier LEADERBOARD, which ranks incumbents in order based on U.S. retail Ethernet port share for this segment, is an industry benchmark for measuring Ethernet market presence. To qualify for the 2017 U.S. Incumbent Carrier Ethernet LEADERBOARD, companies must achieve either a top rank or a Challenge Tier citation on the 2017 U.S. Carrier Ethernet LEADERBOARD. Incumbent Carrier is one of three U.S. provider segments, along with the Competitive Provider and Cable MSO segments. 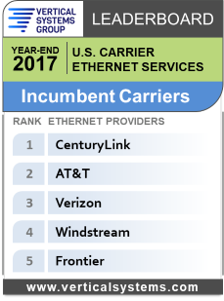 CenturyLink jumps to first position on the 2017 Incumbent Carrier LEADERBOARD based on Ethernet ports from its Level 3 merger, up from third position in the previous year. As a result AT&T moves into second position from first, where it had been perennially ranked in the incumbent segment. Verizon (including ports from its acquisition of XO) is in third position, followed by Windstream at fourth position. Frontier gains fifth position for its initial entry to the Incumbent Carrier benchmark ranking. Other companies in the Incumbent Carrier segment selling retail Ethernet services in the U.S. market include the following (in alphabetical order): Alaska Communications, Cincinnati Bell, Hawaiian Telecom, TDS Telecom and other incumbents.